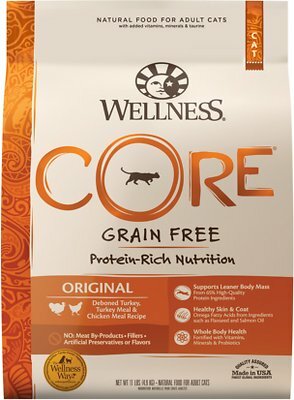 Nourish your favorite feline’s primal essence with the protein-rich nutrition of Wellness CORE Grain-Free Original Formula Dry Cat Food. 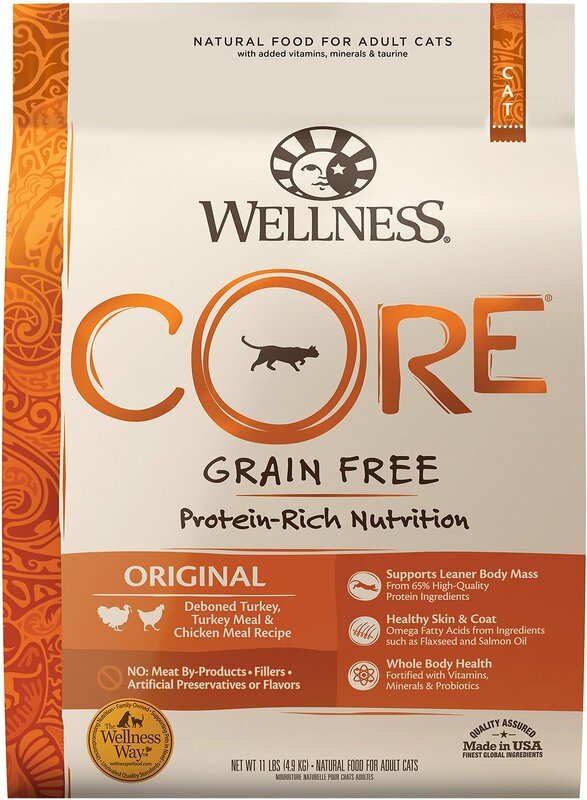 With deboned turkey and deboned chicken as the first two ingredients, this nutrient-dense, grain-free recipe contains all the protein needed to help your adult cat maintain lean, powerful muscles. 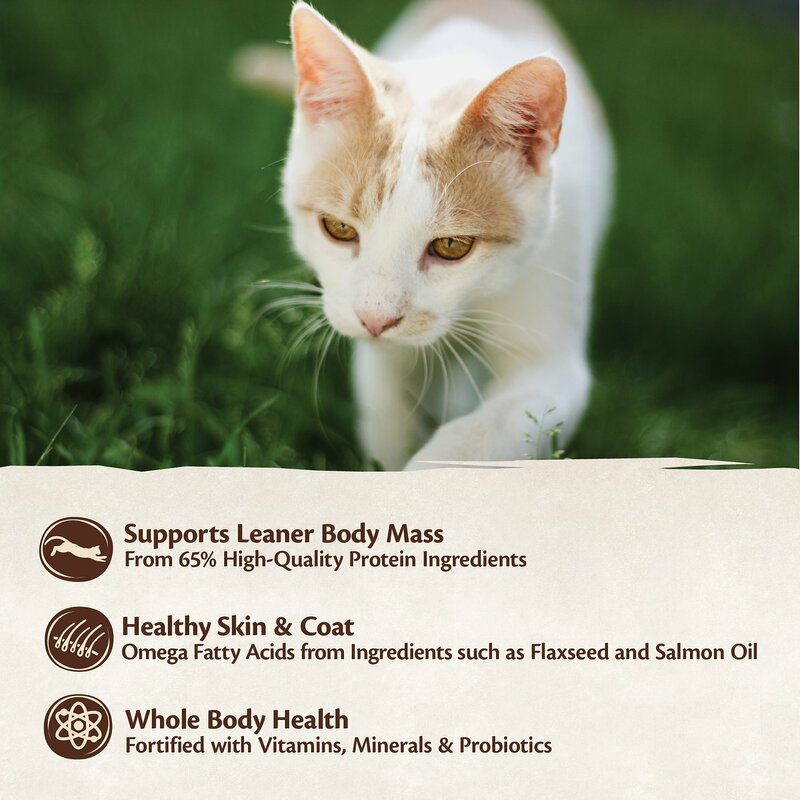 It’s fortified with antioxidants, omega fatty acids and probiotics to make sure his immune system, skin and coat, and gastrointestinal systems stay healthy and strong throughout his long, active life. 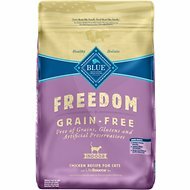 You can be sure your furry friend is getting everything he needs to thrive from the core with this premium-quality diet that contains no wheat, fillers, or artificial ingredients. 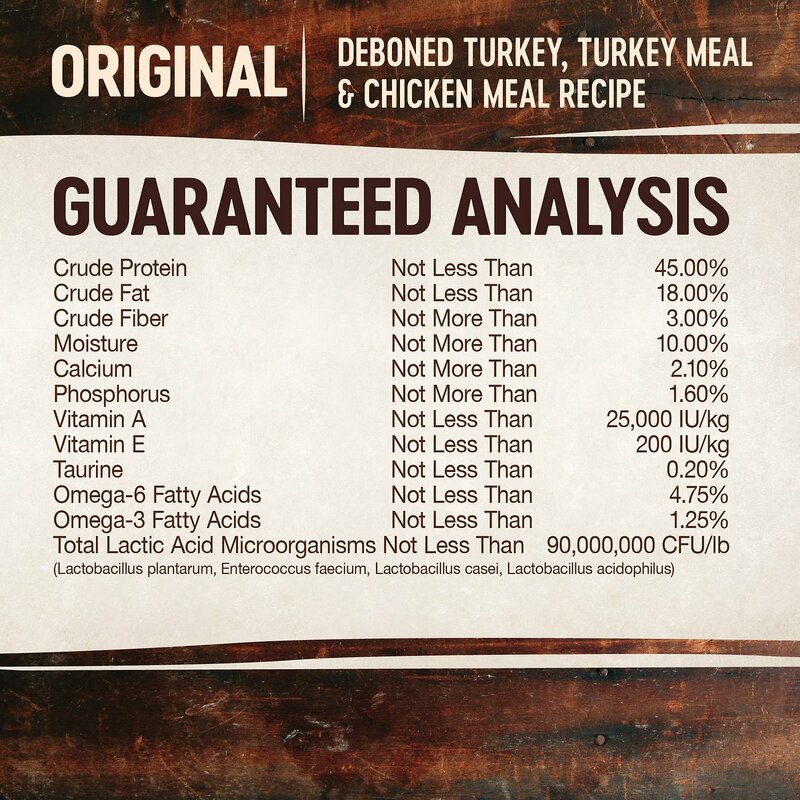 Real deboned turkey and deboned chicken are the first two ingredients in this protein-rich, nutrient-dense recipe; contains no meat by-products or fillers. Flaxseed and salmon oil provide essential omega-3 fatty acids to support healthy skin and a smooth, lustrous coat. Antioxidants including cranberries offer naturally unique dietary contributions and overall immunity support. Fortified with vitamins and minerals for whole body health; proprietary Acticoat probiotic coating helps support healthy digestion. Our furry best friend Izzy is a Wellness fanatic! She has been on various Wellness feline dry and wet foods since she was 6 weeks old and now that she’s a mature kitty at 9 years old, she’s still loving her food. She’s healthy, happy, feisty, and loving life. Thank you, Wellness, for great products! 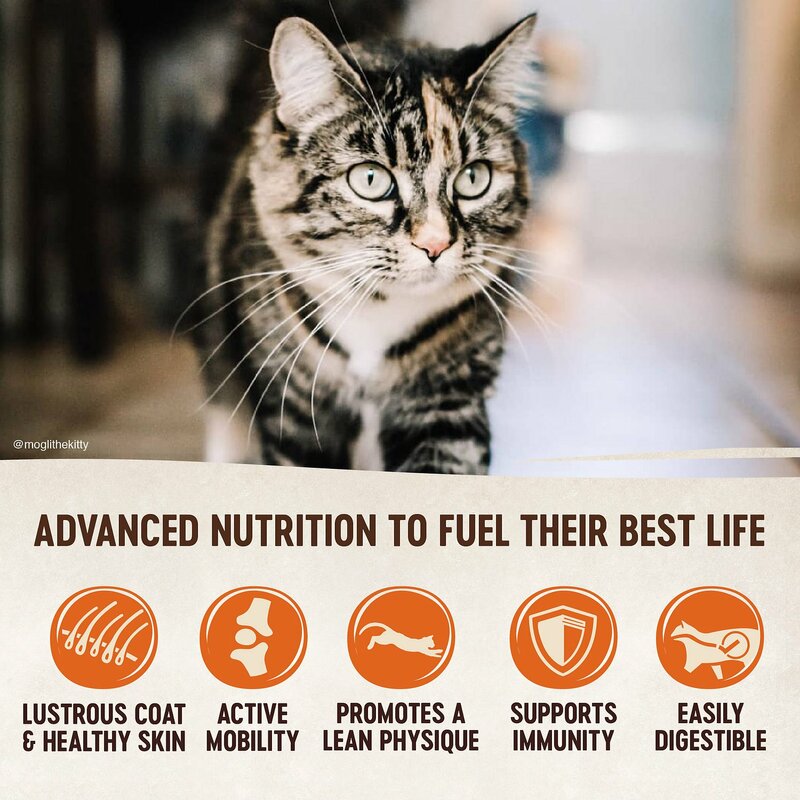 I am transitioning my two cats from Wellness kitten food to adult food and I can tell you they love this stuff and from what I read it is healthier than many other brands out there. Overall, it's a good dry food. My cat likes the taste. However, because it's high in protein and grain free, it's very high in calories. It causes my cat to gain weight. My cat gains weight easily and likes to eat a lot so this isn't suitable for him. When will the Nutro Grain-Free Adult Salmon & Potato Recipe Dry Cat Food, 14-lb bag be available. That is really the only dry food my cats will eat that is healthy. My cat eats a raw/wet diet. However, we put out crunchies for him in case he needs a mid-day snack and to promote dental health. 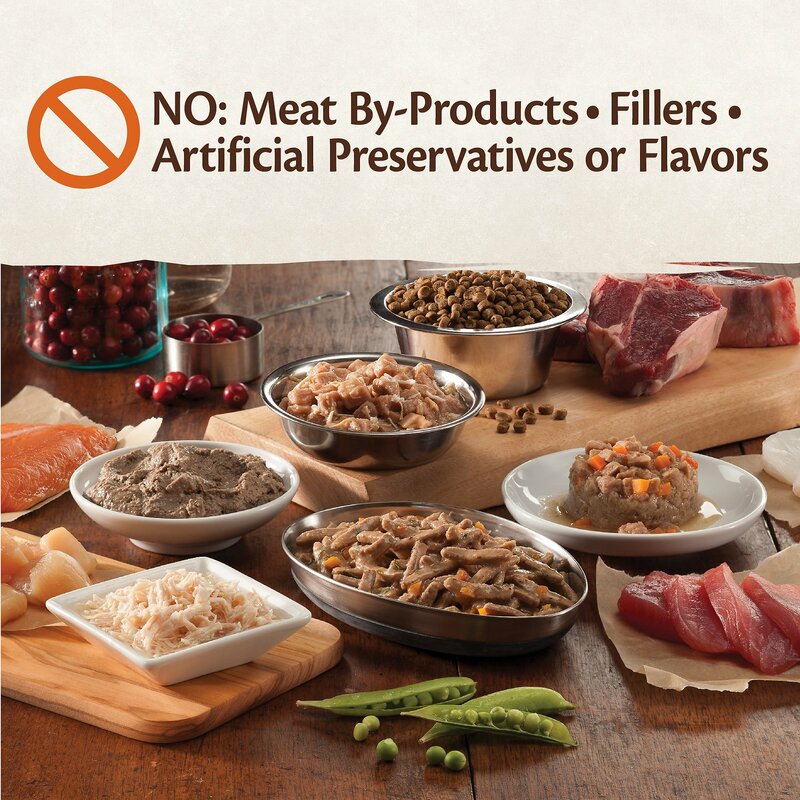 This is one of the better dry foods, nutrition-wise. It's a nice texture and a good kibble size for an adult cat. I get the big bag, portion it into gallon-size freezer bags, and keep all but one in the freezer until it's needed. This helps keep it fresh, as a large bag lasts me about a year. As a part of a mostly-wet diet, this is an excellent dry option. I've used Wellness for quite awhile. I'd delighted the Core products are now less expensive. My one quibble is that the bottom of the bags of kibble retain "dust". I find I have to sift the kibble in a fine mesh colander so my cats will eat it. This may be a highly nutritious food but my cats don’t really like it. If you can’t get them to eat, it doesn’t matter how good for them it is, right? 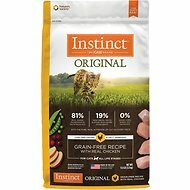 I have one cat that is part feral, she needs a higher protein, so I mix this with another. It has gotten her weight down and she looks much better. Love getting a bigger bag I couldn't find in stores. None of my three cats would touch this food. During the food transition, they picked each morsel of their old food out of this and would not eat any of this food. It doesn't really smell great even though it has better ingredients than their old food, so I guess I can't blame them. In the end, it comes down to whether my two cats will eat this, and so far so good! The kibble is probably the smallest size I've seen. It's flatter than regular Wellness dry good.